Google Inc's most profitable venture Google Adsense developer left Google to start his own company. “I’ve been having the itch to do something entrepreneurial for awhile now,” says Rajaram, 33, known by Googlers as one of the “godfathers of AdSense.” “I’m in my early 30s and I have some experience and financial security, so the time felt right.I have some ideas on the consumer Internet side,and I’m still trying to flesh that out in the next few weeks. Right now, I’m just trying to get used to not going to work. "Says Rajaram happily after leaving Google on 2 November 2007. Some bio stats of Gokul Rajaram and Adsense:. Gokul Rajaram joined Google in January 2003,with Brin and Wojiciki he worked on selling advertising space on publisher's website.After seeing huge profit in Adwords they proceeded with this project.With Adsense creating huge vibrations in the web publishing market and helping blogs and content websites into profitable money making hubs,Google generated whooping $1.45 billion from Adsense (1/3 rd of the total Google Revenue earned). Rajaram, who left Google on Nov. 2., says he’s also interested in pursuing journalism or writing. Rajaram also remembers" “The night before we launched, Sergey spent five hours with me testing the system and pointing out bugs." Whatever venture he pursues, he is blessed with top Google (GOOG) brass Eric Schmidt and Sergey Brin. Product management vice president Susan Wojcicki honored him with a large plaque signed by a few hundred Googlers at his farewell party at the Googleplex in Mountain View, Calif., two weeks ago.He also showed interest in journalism and writing.Maybe he would start a blog and earn from Google Adsense. Google's phone can be described as phone with surfing around,intense search engine tool,e-mail,advanced web-browser application and many such features which are extremely useful and sure enough are trustworthy.Yes Google is now going beyond is what we thought no other web-giant can.Google has some final talks with telecom companies and is now almost ready with the phone. 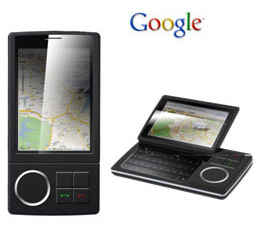 The Google Phone brings the power of the internet in your hands with very simple interface. It combines the traditional voice and SMS capabilities of phones with all the exciting Google services accessed on the PC such as Search, Gmail, Maps, Blogger….. and the list goes on.Google is going to use Android(company owned by Google) as the mobile platform. All these internet services will be available under a simple Internet monthly flat fee, comparable to PC Broadband products, giving you transparency and control over your mobile bill.And because of Google will even give you a 3 month discount on your mobile Internet monthly flat fee.